Thomas Mayne Reid was educated to become a Presbyterian inister, but he wasn't motivated and didn't obtain his degree. In 1839 he left for New Orleans and moved on to New York City, where for short times he worked as a corn trader and was the teacher of Gernaral Peyton Robertson's children. He went to St. Louis and to the Rocky Mountains and then settled in Philadelphia as a journalist. There he met Edgar Allan Poe, who was his drinking companion for a while. In 1846 he volunteered for the army to fight in the war against Mexico. In Vera Cruz he acted as a newsapaper correspondent, but he was wounded at Chapultepec on 1 May 1843 and promoted to first lieutenant for his courage. In 1848 he was discharged from the army. During the same year his first play "Love's Martyr" was produced in New York. By 1850 he was in London and his first novel "The Rifle Rangers" was published. More novels followed. He married his publisher's daughter Elizabeth Hide in 1853. She was fifteen at the time. During the 1850s en 1860s he continued publishing novels, but he spent more money than his work earned him and in 1866 he was declared bankrupt. He went back to New York where he founded the "Onward Magazine" in 1867. But things didn't go too well and his old wound caused him to spend several months in hospital. Elizabeth didn't like the USA at all and in 1870 they returned to England, where they lived at Ross on Wye, Herefordshire. He suffered from bad health and was hardly able to write. In 1883 he died in London, aged 65. 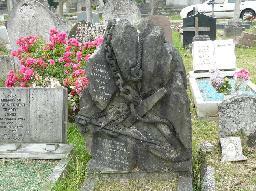 The grave of Thomas Mayne Reid at Kensal Green Cemetery, London.